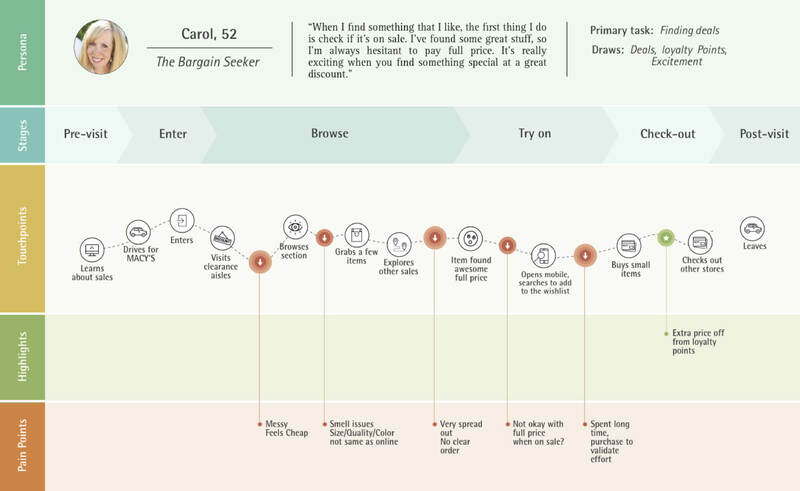 A service design concept for the next generation of the department store shopping experience. Department stores used to be the dominant force of the retail landscape, back when going to the mall was a fundamental part of the American shopping ritual. However, the shift in consumer preferences towards online retail has put the future of the brick and mortar stores in serious jeopardy. 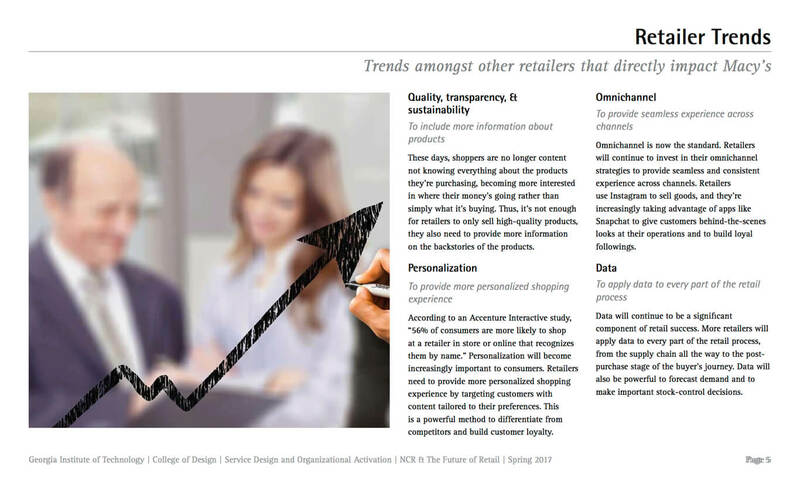 For department stores to remain relevant in a digital age, they need to adapt their services to connect with customers and provide a more compelling reason to shop in stores. The goal of this project was to create a compelling vision for what the department store shopping experience could look like in five to ten years. I had the opportunity to work on this project as part of my Master's degree at Georgia Tech. We were extremely fortunate to be sponsored by NCR and Macy's, which gave us direct access to the stakeholders that would be impacted by our proposed design solution. This project was divided into two phases, Research and Design, each lasting about eight weeks. For the research phase, eight people from three different design teams formed a 'meta-group' to build a broader, more complete collection of insights. During the design phase, each team worked separately to brainstorm and develop their solutions. Since the purpose of this project was to persuade key stakeholders to buy into a vision for the future, our process focused on communicating our design and bringing the experience to life. As a result, we allocated more time to visualizing our concept and its rationale than, say, testing the usability of our touchpoint interfaces. We created this short video to introduce the key points of our design solution to stakeholders during our final presentation. 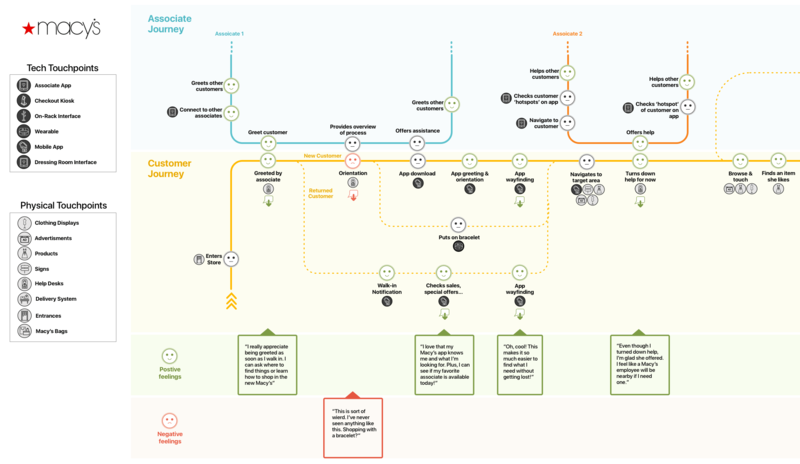 Starting with a condensed visualization of our service design was an effective way to frame the research and design considerations that followed. This video was created in three school days with nothing but cardboard, a green sheet, a campus printer, lots of caffeine, After Effects, and a desperate attempt to prevent a towing company from booting my car. One of the most compelling draws of the department store is that there is something for everybody inside. 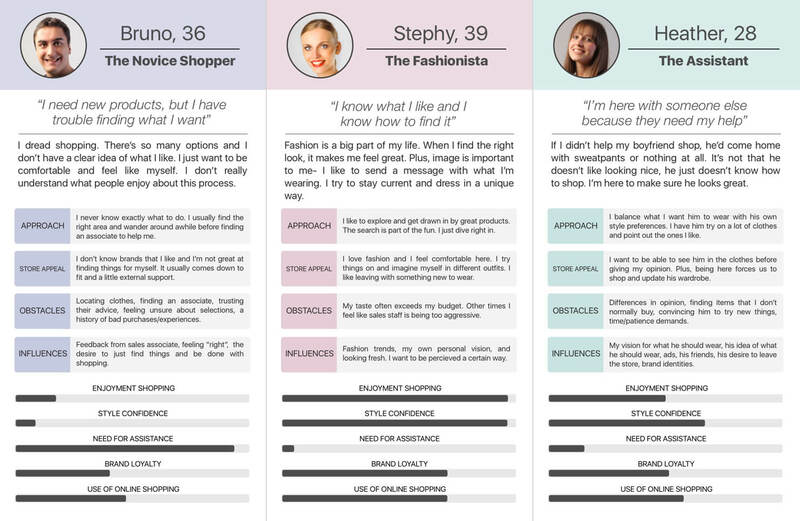 In terms of understanding the customer, this broad appeal presented a major challenge-- with so many different customer types, there was tremendous variety in their approaches to shopping, preferences, and pain points. It took a dedicated effort to make sure that our research acknowledged and understood every customer segment. We compiled our insights into a document to communicate our findings to stakeholders. It was also a great way to consolidate two months of data gathering into key insights and areas of opportunity. Including all of our research here would be a bit overwhelming, so I've included a sample of our findings below. For the brave (or curious), the entire document can be viewed here. 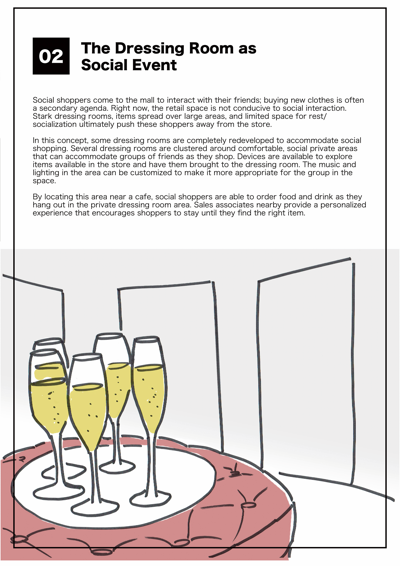 For certain customers, shopping is as much about socializing as looking for things to purchase. However, the current store environment does little to accommodate these shoppers. 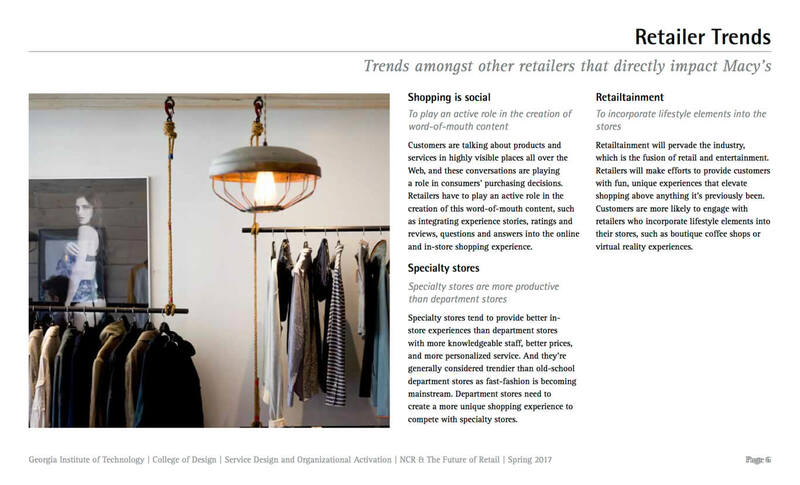 Customers are drawn to the store environment to 'try before they buy' and find the perfect item. But, the current process of trying on clothing is frustrating, uncomfortable, and lacks character. Disorganized racks and tables, large stacks of identical items, and an overload of visual stimuli make the process of finding the right item stressful and cognitively busy. The only way for customers to gather items is by holding them as they shop. They'll have clothes in one hand, coffee in the other-- and then their phone rings. It's a lot to juggle. 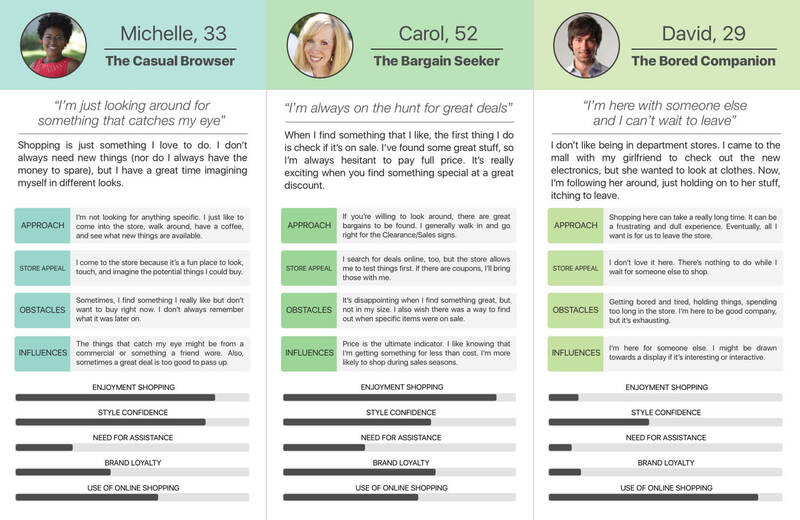 To bring our research to life and capture the full scope of Macy's diverse customer base, we developed nine personas. 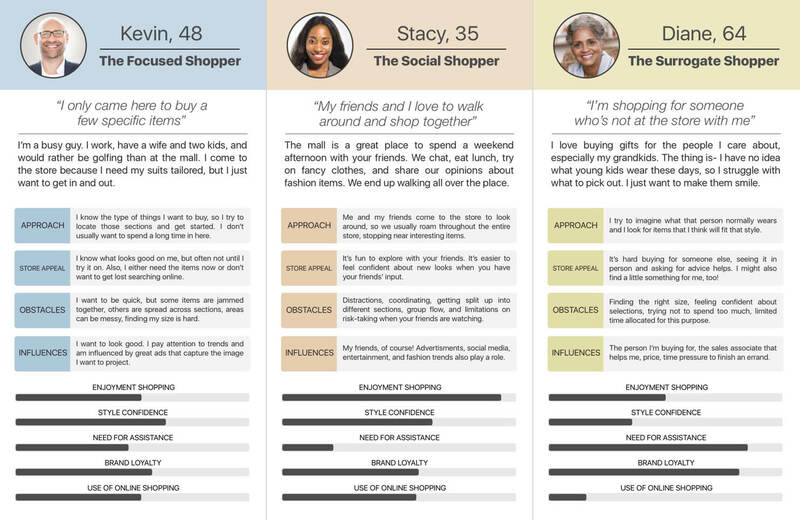 From there, we identified which customer archetypes were most critical to the future of shopping in Macy's stores by evaluating each persona on several factors: their relative advantage of in-store shopping over online retail, the proportion of revenue they generate, their habits/attitudes towards shopping, and the potential for an improved customer experience to impact their behavior. 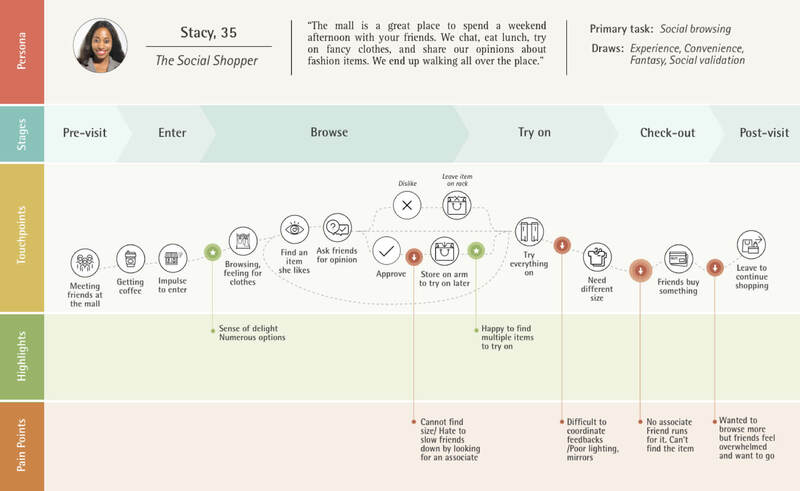 For each of the key customer segments, we developed customer journey maps to understand their approach to shopping at Macy's and the highs and lows of that experience. With the research phase complete, it was time to break into our individual design teams and start developing a solution. Over the course of several meetings, we honed in on the areas of opportunity that our service would address. We then ideated as many solutions as possible before passing judgement on any given concept. 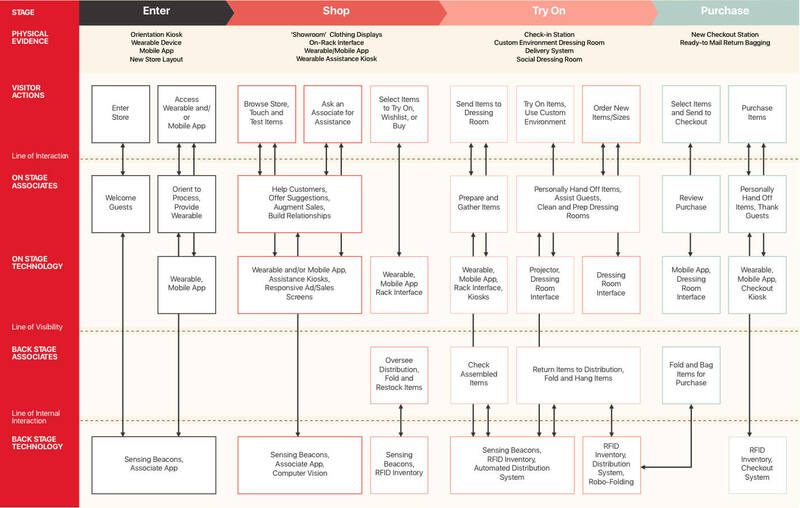 Over time, by visualizing how potential approaches would be experienced by our target customers, we were able to narrow our search to a set of interlocking concepts that addressed all of our major considerations. We summarized our proposed design solutions to get feedback on our concepts before moving forward. Sharing our ideas with the other design teams helped us identify considerations that we may have overlooked during our brainstorming sessions. 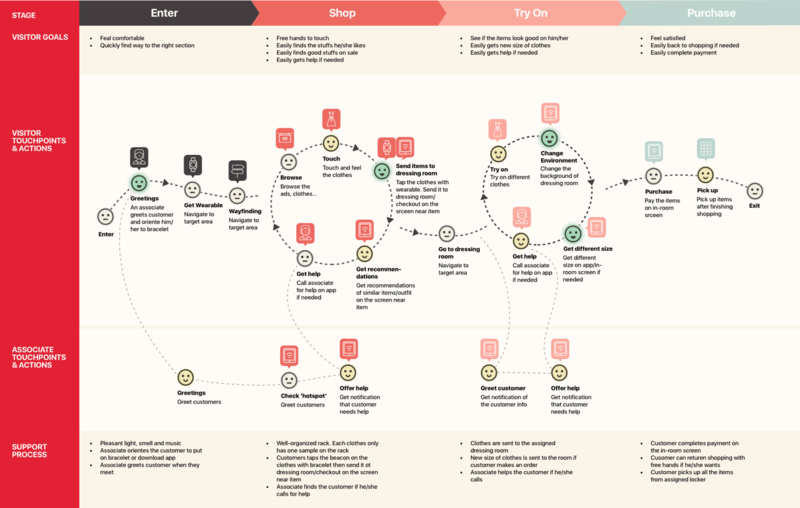 The central component of our service redesign was the concept of 'Tap Shopping'. 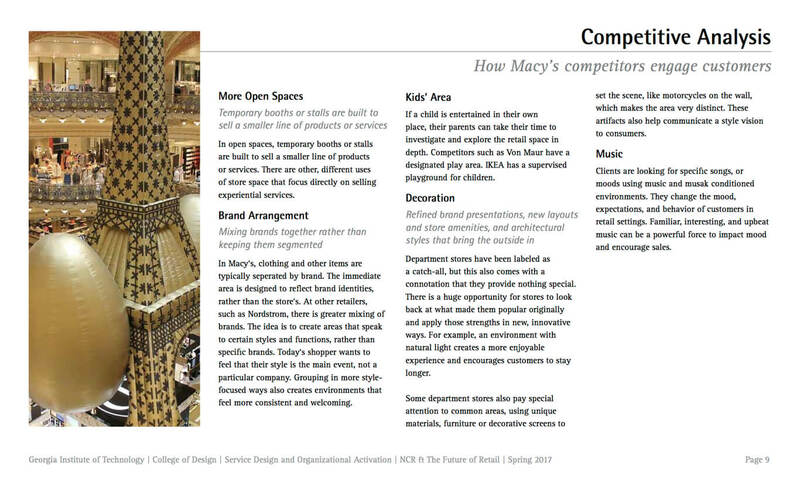 In our vision for the Macy's of the future, the sales floor is transformed into a showroom, where items are displayed individually. 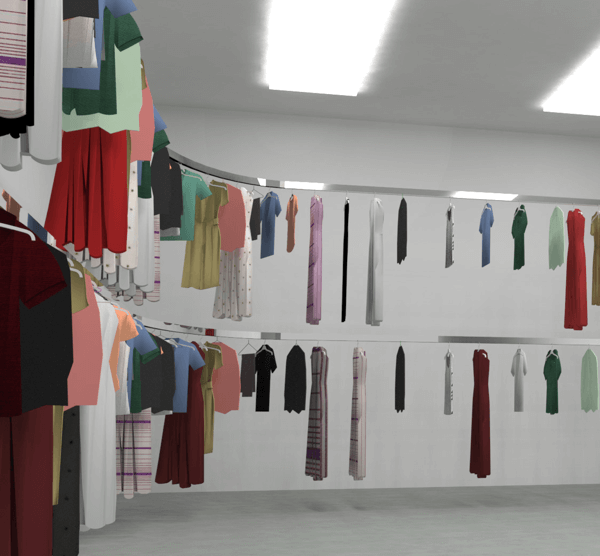 Instead of sifting through racks of clothing, customers can gather items by tapping a wearable or mobile device to an on-rack interface that connects to the backroom inventory. To illustrate this approach, we developed storyboards that highlighted key steps in the process. 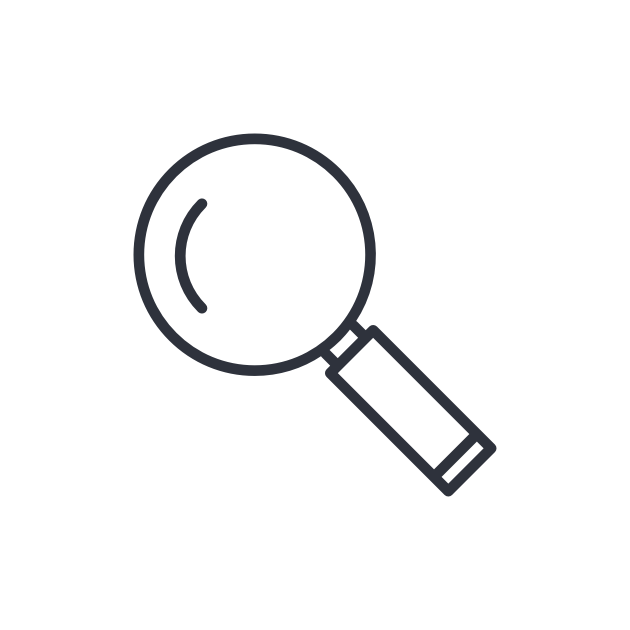 Our approach to developing the finer points of our vision was to build incrementally granular versions of the customer journey. 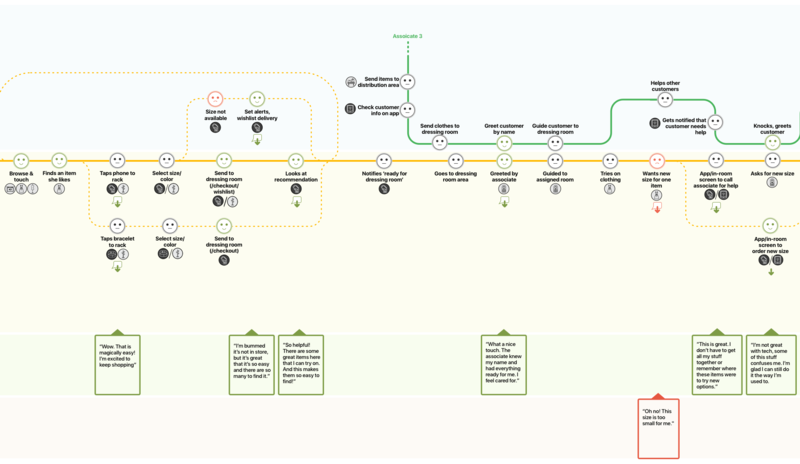 By comparing these revised customer journeys to the existing service, we were able to highlight how our proposed solution addressed the major pain points of the current experience. 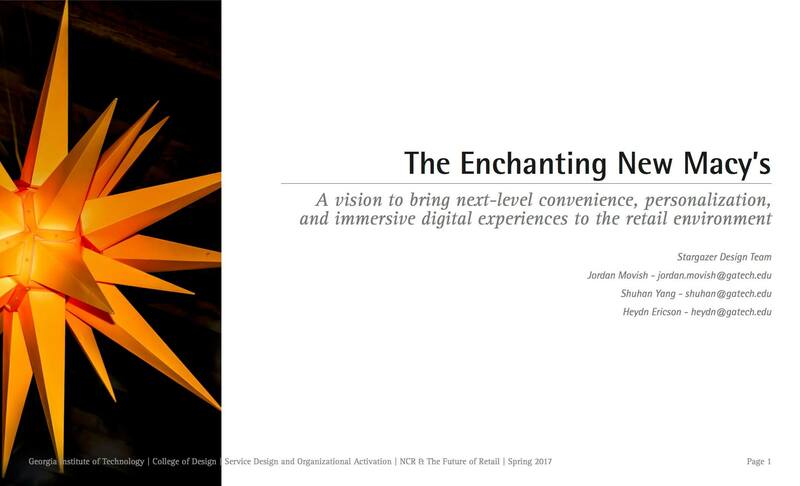 Small considerations have a big impact on experience design. 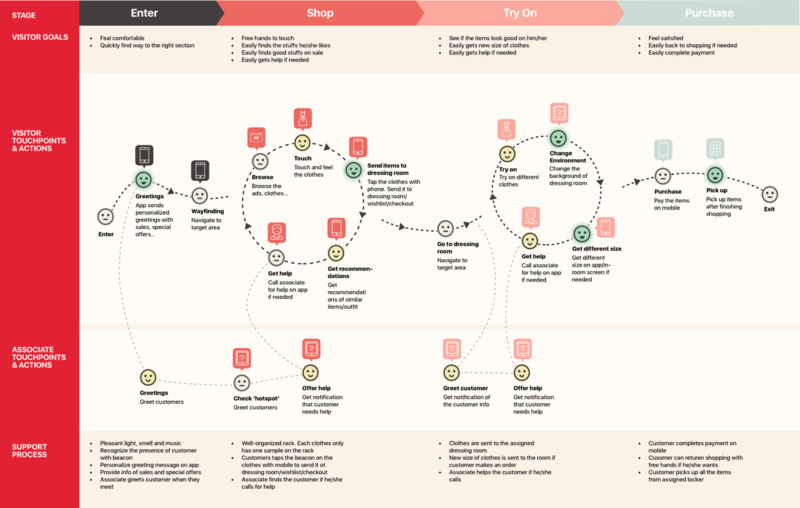 To make sure that every interaction between customers, associates, and the retail environment was supported by our design ecosystem, we developed an extremely detailed customer and associate journey. This exercise helped our team understand the role and functionality of the different touchpoints that would be needed to power the new service. After solidifying our concept and identifying the necessary touchpoints, changes to the store environment, and interactions, it was necessary to demonstrate how all of these components fit together. 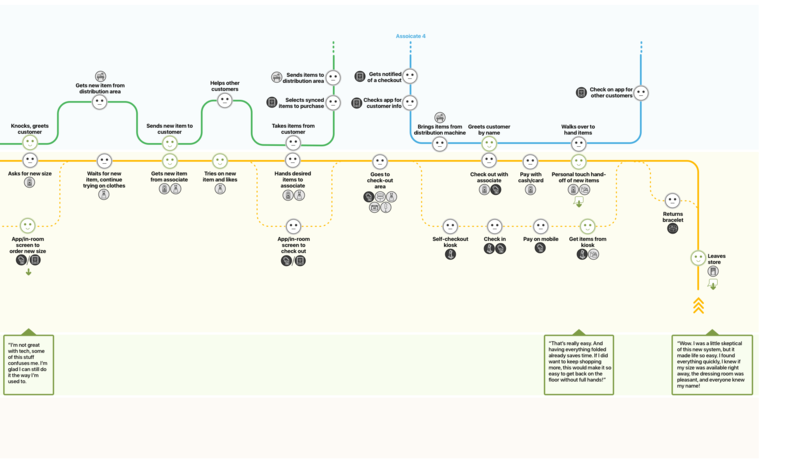 The service blueprint helped us communicate how technology powered the connection between customers, employees, and touchpoints. 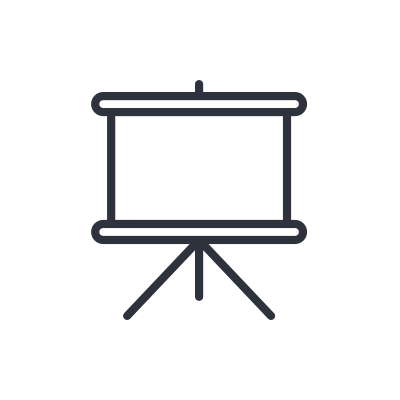 Selling a concept to stakeholders relies on capturing their imaginations by creating an immersive, shared vision. To capitalize on this, we built mockups of the new store environment at each of the major phases of our experience. The goal of these visualizations was to make it possible for someone unfamiliar with our concept to quickly understand the fundamentals of our proposed solution. Displaying items individually liberates the retail floor from messy displays and cluttered racks. 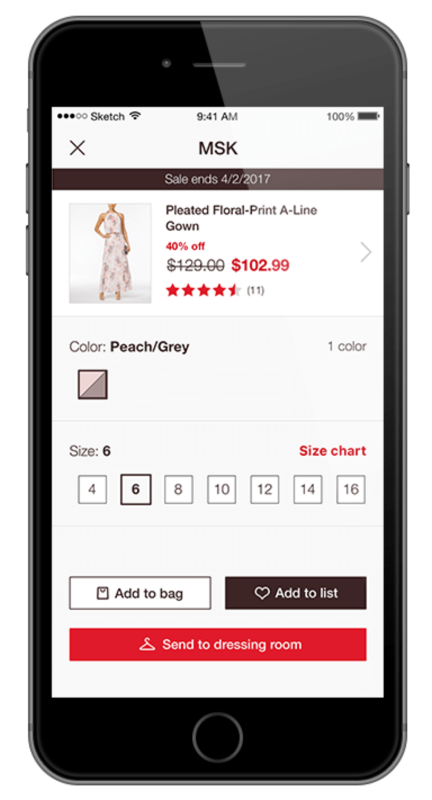 By tapping a mobile phone or wearable device to an on-rack interface, customers can quickly determine if their style/size is in stock and send it to the dressing room or directly to checkout. On-rack interfaces also display sales promotions and personalized outfit recommendations. 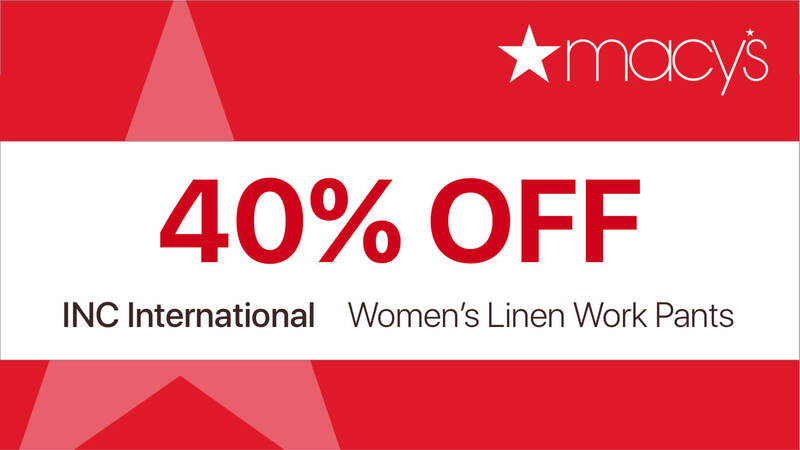 The social dressing room gives friends a compelling reason to visit Macy's. With a comfortable environment and individual dressing room stalls, it's now easier than ever to get your friend's opinion about your new look. 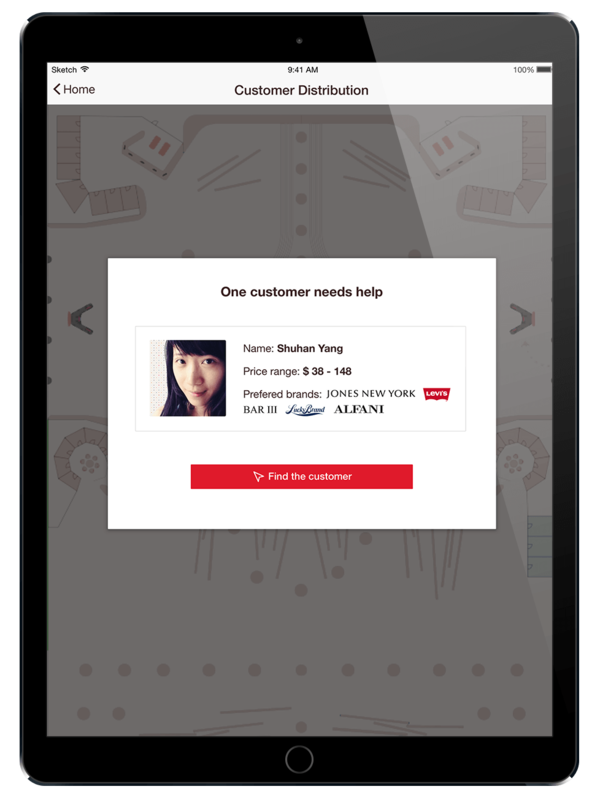 Using tablets, customers can have food delivered from the nearby restaurant or search for clothes to try on. It's all part of making the department store a place to gather and hold events. Trying out a new look is about imagining possibilities and personal transformation-- the dressing room should be a place where that is celebrated. 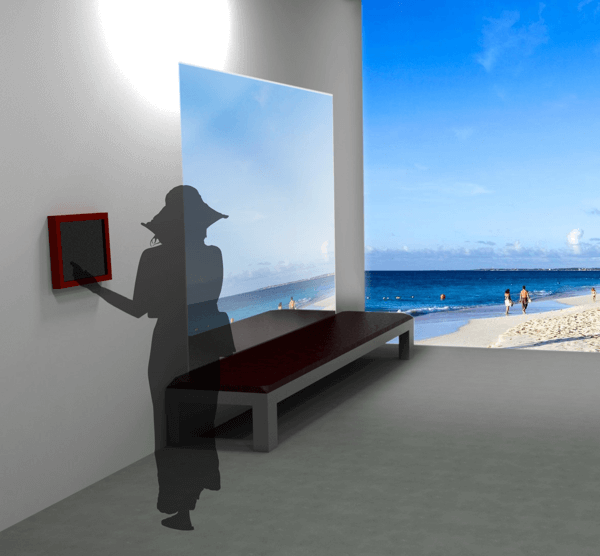 From an in-room interface, customers can change their environment to check out their new looks in different contexts. 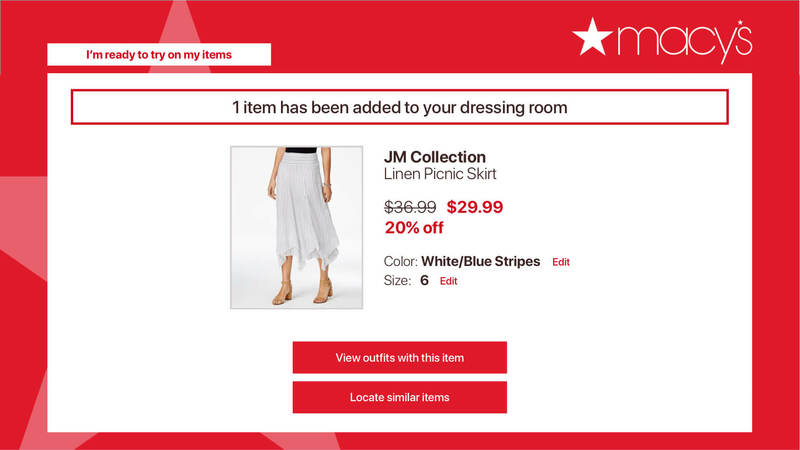 The interface also allows users to order new sizes and styles and have them delivered directly to the room from an automated backroom inventory. Having checkout stations in every department is confusing, requires multiple purchase processes, and keeps associates pinned to a location instead of helping guests. 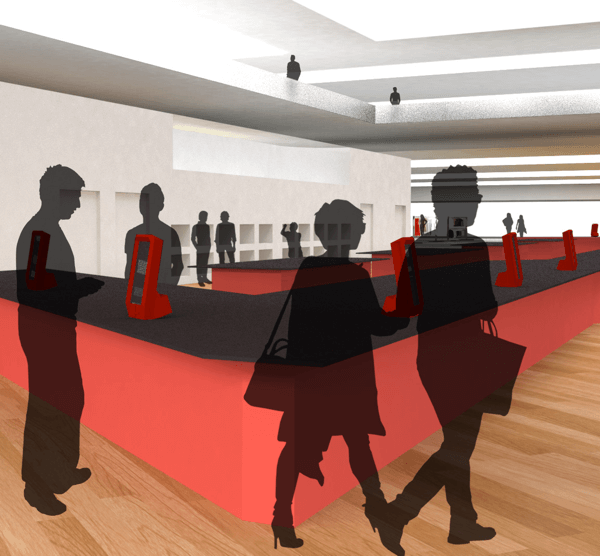 In our concept, a centrally located checkout center makes it easier to pay, return items, and find help. 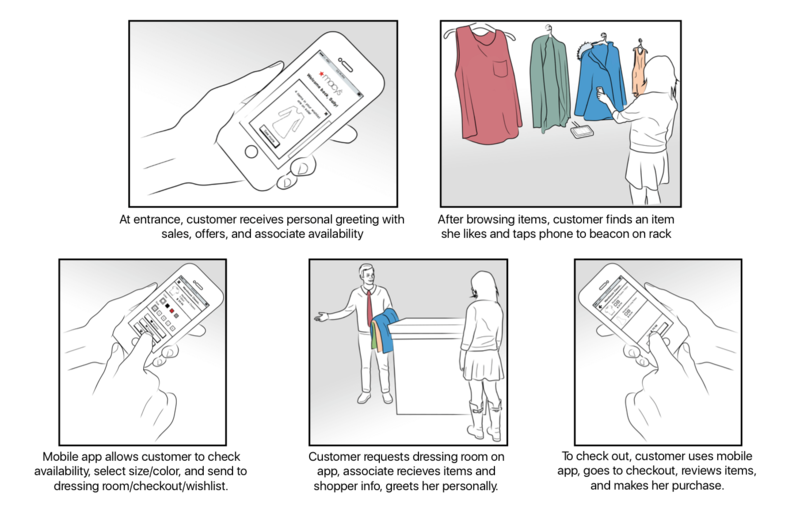 Associates can now help guests without being tethered to one area. It also clears up valuable floor space to make room for the backroom inventory. An automated backroom inventory is the dynamo that drives our innovation, bringing next-level convenience to the department store shopping experience. Networking the inventory with the on-rack interfaces lets customers quickly determine if their size is in stock. 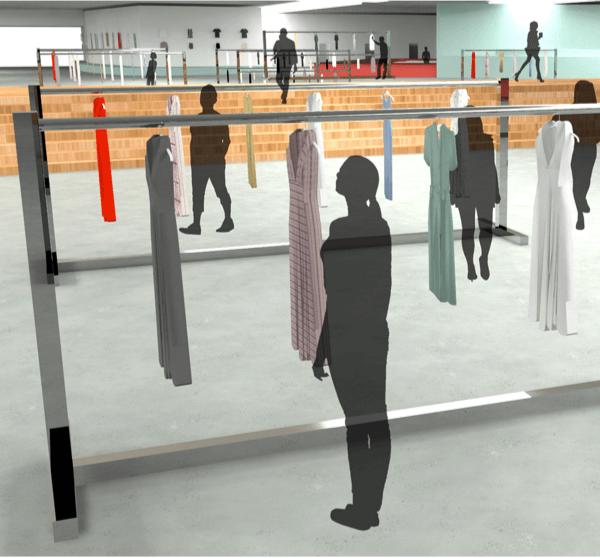 Using a conveyor system, items can be assembled and automatically delivered to the dressing rooms or checkout center. 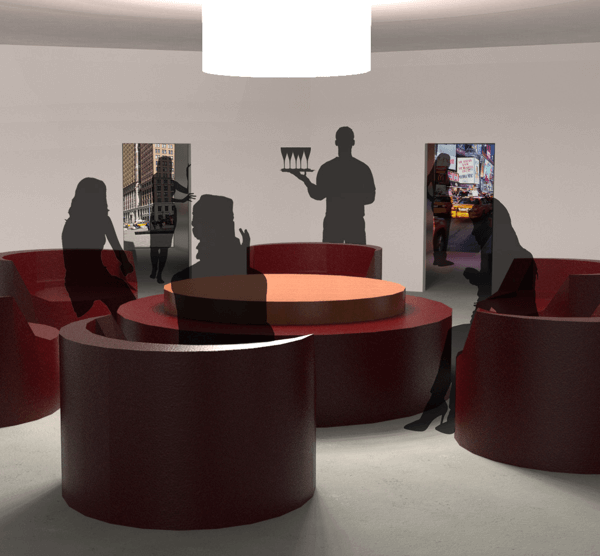 Our store layout shows how each of our design concepts fit within the physical store environment. 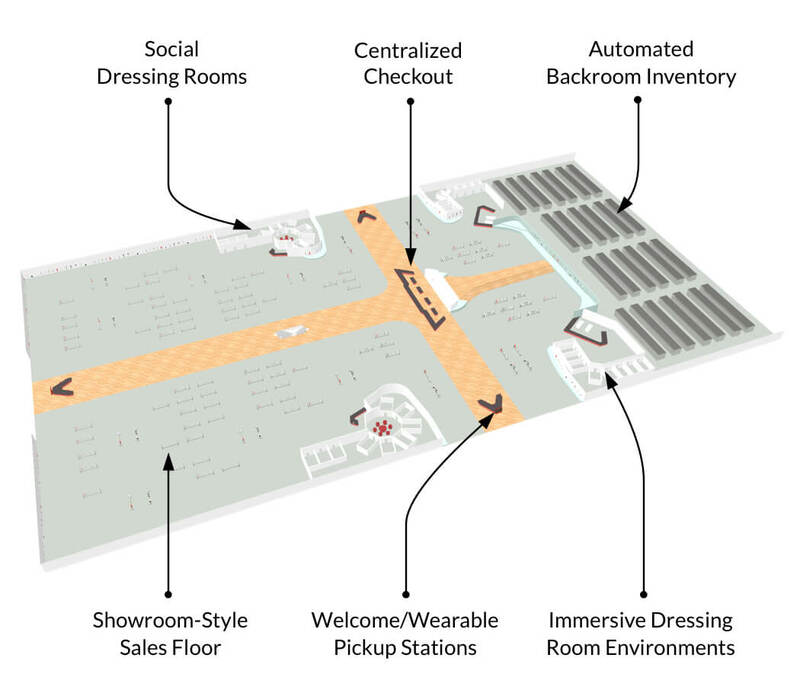 The showroom-style retail floor frees up space for the automated backroom, which is located adjacent to the checkout and dressing room areas for faster delivery and a more compact infrastructure. Our innovation utilizes a number of touchpoints to connect with customers and empower employees. One of the interesting considerations that resulted from the structure of this project was designing for communication, rather than usability. As a result, we jumped directly to higher fidelity prototypes, which served as a model for what more thoroughly designed systems could look like. To evaluate the touchpoints, we relied on our experience as designers by conducting 'quick and dirty' usability walkthroughs. 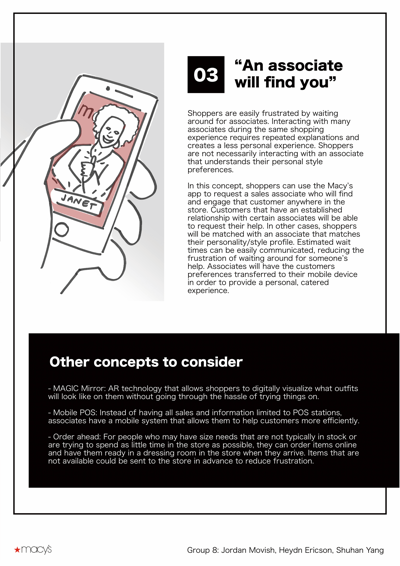 The Macy's Wearable is the primary way for customers to engage the new shopping experience. Customers pick up a wearable from one of the welcome kiosks located near the entrances. 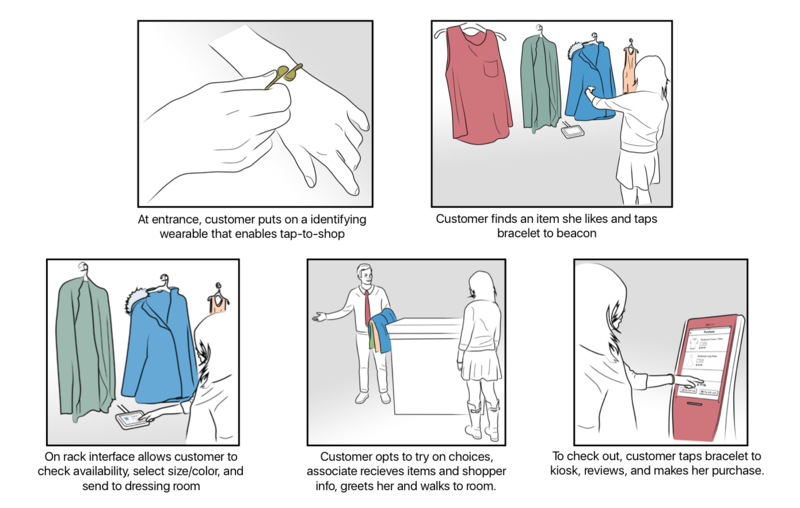 By tapping the wearable to the store interfaces, they can gather items to try on or purchase without the hassle of carrying items or sorting through racks. The wearable also presents some interesting marketing opportunities. Brands could use this touchpoint as a new way to advertise. Or, Macy's could use this as an opportunity to create special editions with unique designs that customers collect. 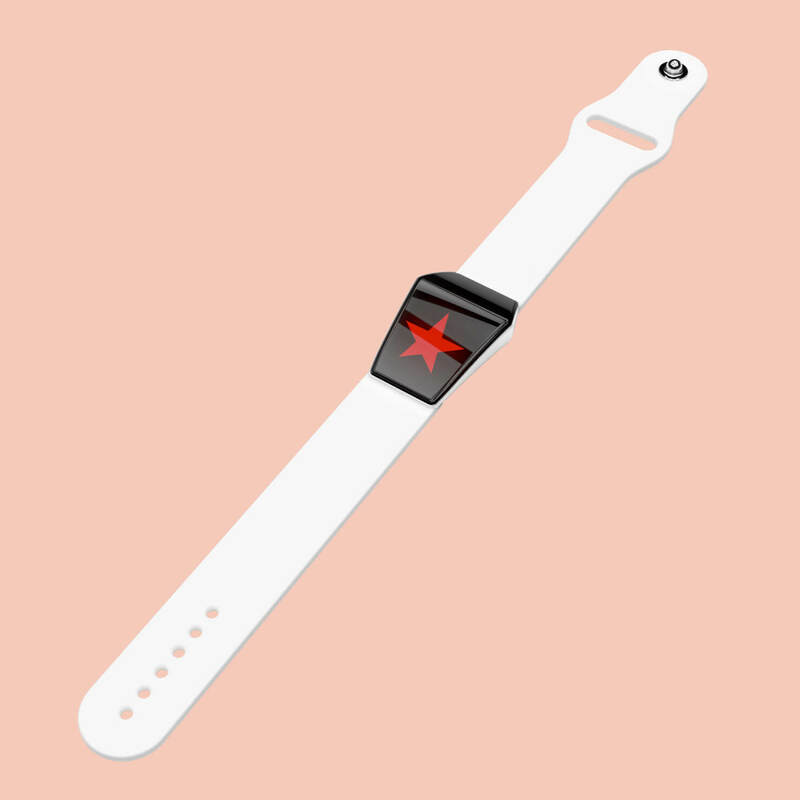 Connecting the wearable via RFID would make it scalable and relatively inexpensive to manufacture. 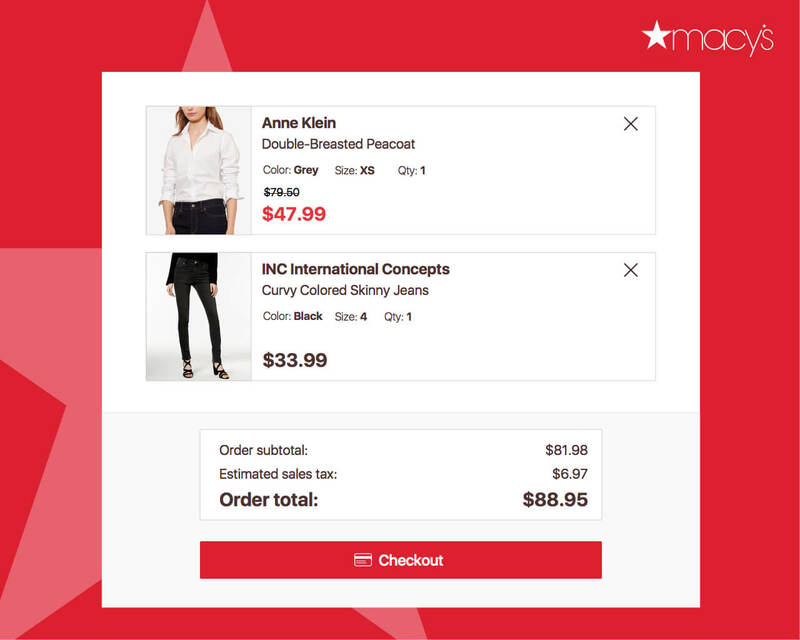 To make the new experience accessible to a variety of shopper preferences, 'Tap Shopping' can also be accomplished using the Macy's mobile app. 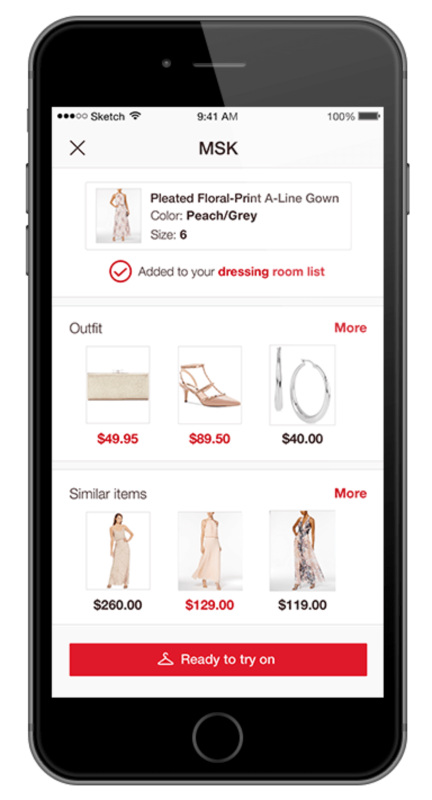 Essentially, the mobile app brings the convenience of online shopping to the brick-and-mortar environment. 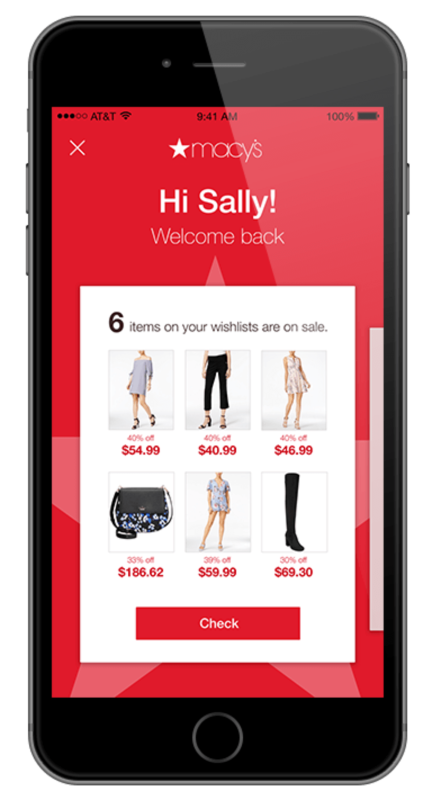 Just like with the wearable, customers simply tap their phone to any of the store interfaces and can do everything from paying for an item to adding an item to their wishlist. With fewer associates needed to maintain the retail space, update signage, and stand near checkout centers, they have more time and freedom to assist customers. 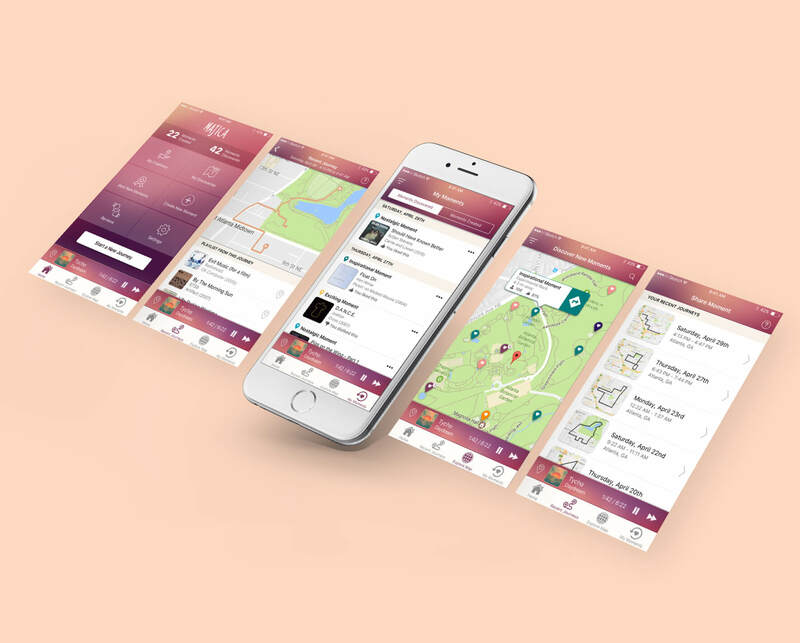 To empower this service, we envision an associate app that gives associates the information they need to provide more personal, responsive customer service. 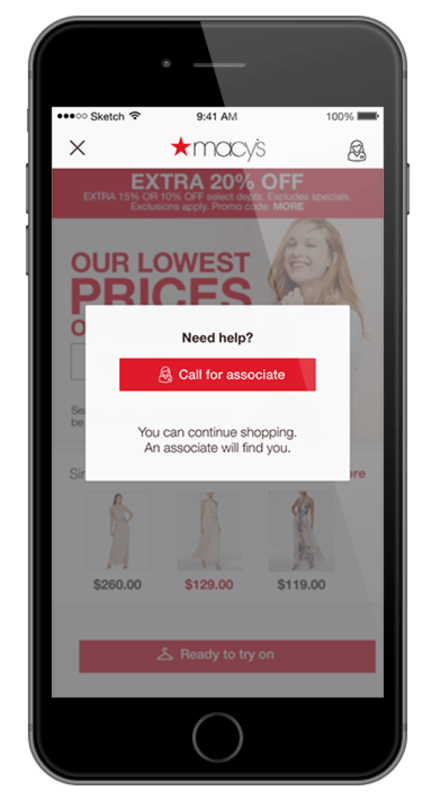 Using the app, associates are notified when a customer requests assistance from a kiosk or mobile device and are provided navigation to their location. Additionally, customers can opt-in to a system that shares their purchase history, which associates can use to better understand that customer's personal preferences. In addition to powering the tap-shopping experience, this interface offers the additional value of serving as easily updated signage, unlike the current analog system that requires a dedicated team of associates to maintain. During our research, we found that when shoppers believe they have personally earned sales offers and promotions, they are particularly effective at driving sales. 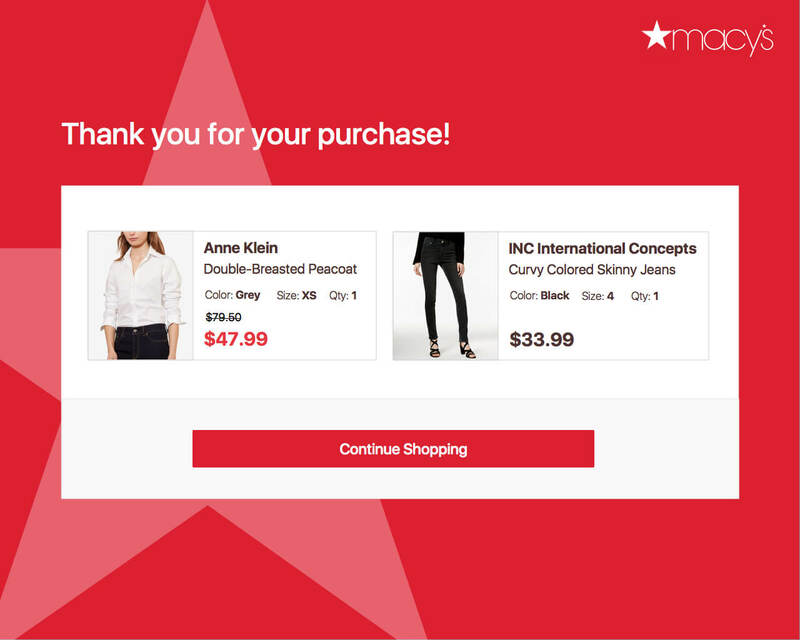 Using this touchpoint to display customer-specific promotions would give these offers a personal touch, offering a new dimension of value to the Macy's loyalty program. 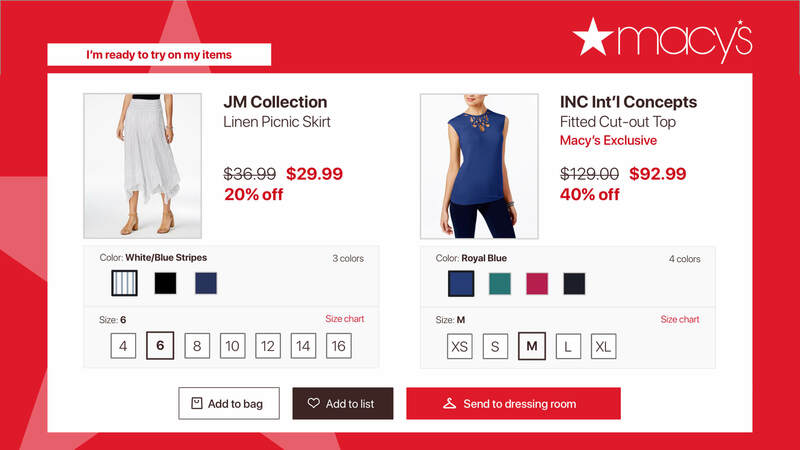 From the dressing room interface, customers can order new items, add items to their wishlist, and make purchases. They can also change the music, lighting, and background projection in their stall to customize their environment and imagine new possibilities. With automation in control of the inventory, the checkout process can be streamlined. 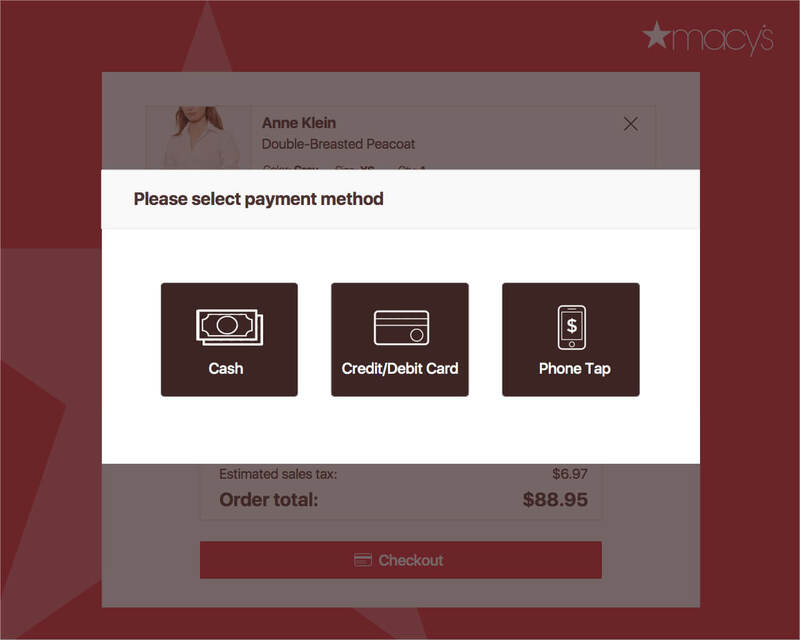 Since their items are stored in the system, now payment only requires a tap from a device with a credit card on file. 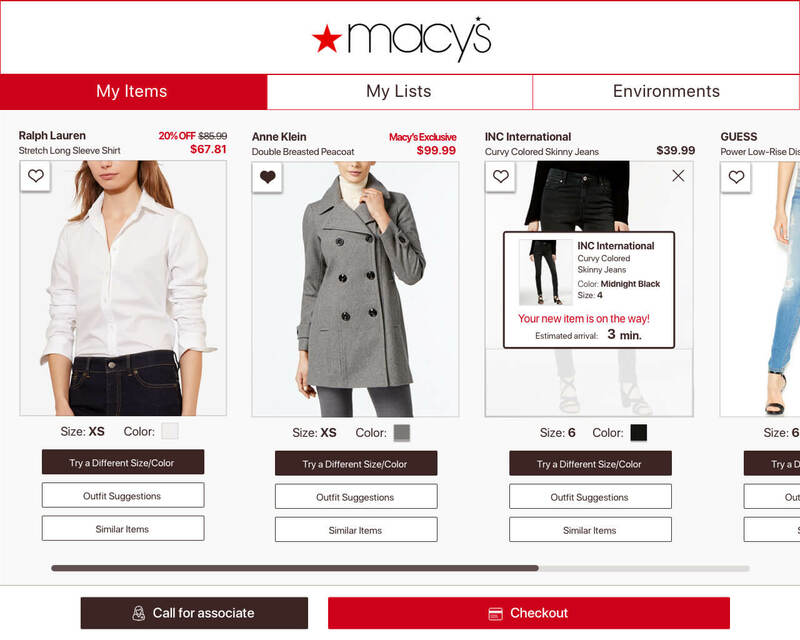 These screens walkthrough what this simplified checkout process could look like. 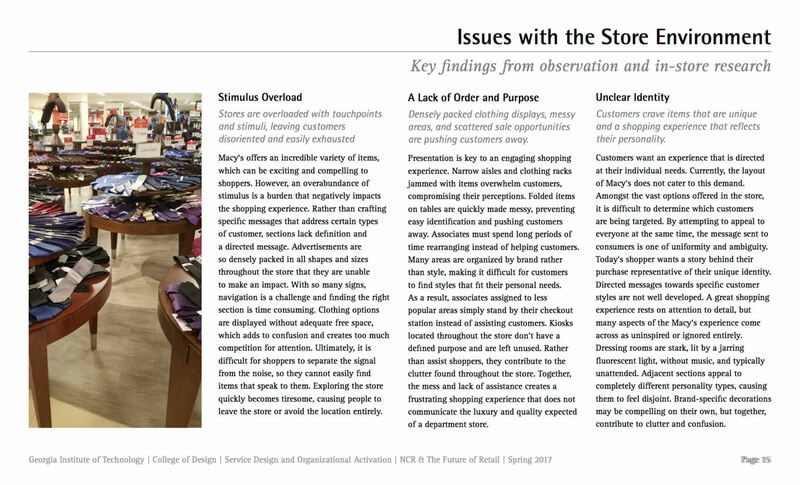 To present our design solution to representatives from Macy's and NCR, we created a document of our design process and rationale to provide additional detail. There's a lot of content from this project that wasn't included in the case study. If you're interested in seeing more, you can check out the full report we presented to stakeholders. This project was a huge learning experience in my development as a designer. Interfacing directly with stakeholders on the business side generated a lot of insight about the challenges of balancing user and enterprise goals. Ultimately, successful designs are capable of delivering outstanding experiences to users and meeting business objectives at the same time. This project gave me an opportunity to explore ways to find that balance. I was also able to explore a number of tools that make it easier to communicate design decisions to a non-designer audience. Executing a design means getting all of the stakeholders on board with enough enthusiasm to overcome the inevitable roadblocks and costs. 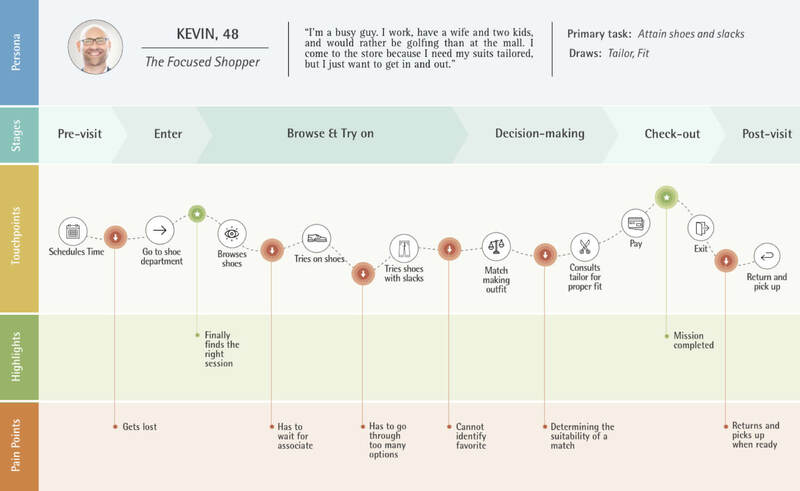 Learning new strategies to leverage visualizations, maps, and other communication tools will make it easier to persuade key decision makers in the future. Another valuable lesson I gained from this project was understanding the complexity of activating organizational change and the barriers presented by legacy systems. 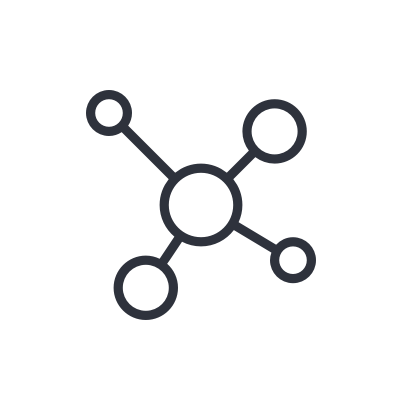 Design solutions do not exist in a vacuum- they impact a sprawling, constantly-shifting network of stakeholders. Particularly in the redesign of a service, the proposal of a bold new vision is only as strong as the roadmap for getting there. 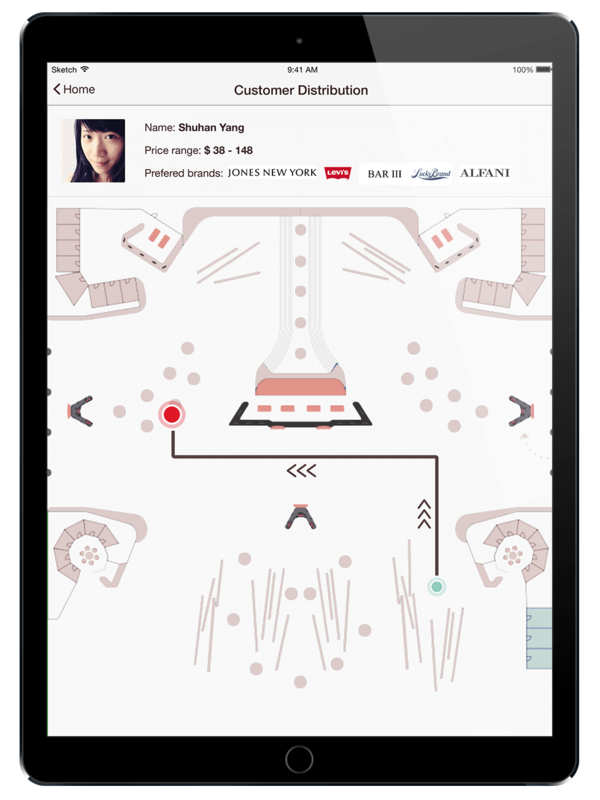 An app that combines music, location, and mood to create and share memorable moments. 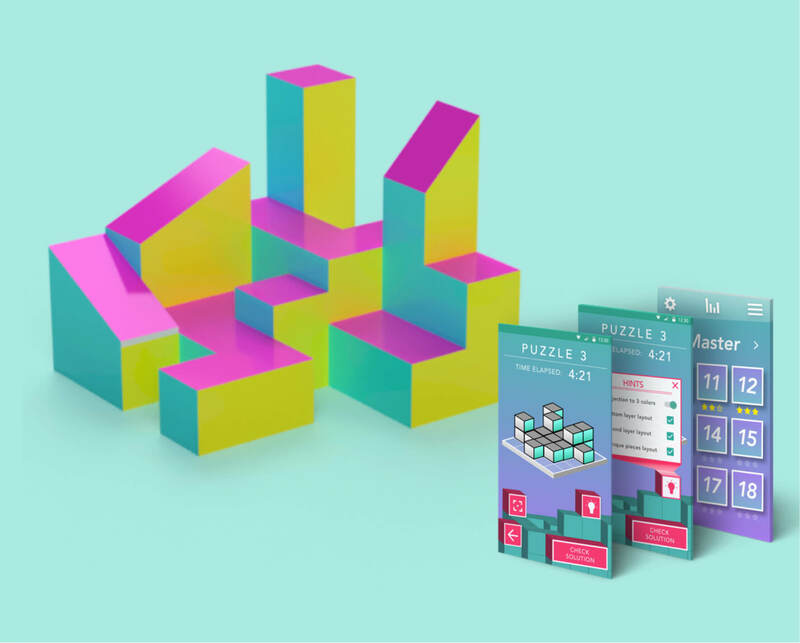 A 3D projection-mapped puzzle designed to challenge group problem solving strategies.